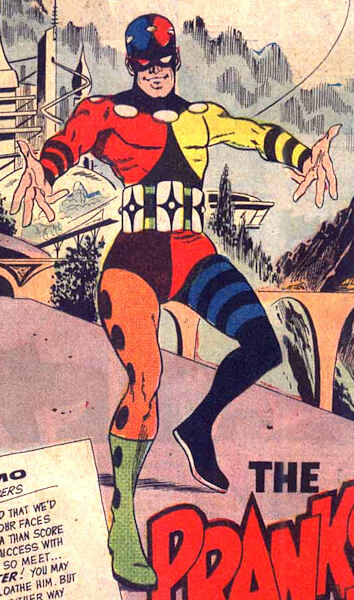 Powers/Abilities: Armed with bizarre gadgets - a laughing gas spray, a jet powered hot air ballon, and a magic flute. In a futuristic dystopia where humour was against the law, one man dared to stand up to the authorities which were trying to crush the human spirit. Armed with special equipment built by Dr.Hiram Grave in his hidden underground lab, the Prankster began his career by preventing the public execution of a man who played music without a permit. This act drew the attention fo the tyrannical Bane who ruled the city with an iron hand, an insane individual madly in love with his own computer, who ordered his right hand man, Captain Wratt, to capture the freedom loving criminal. Meanwhile the hero had returned to his base, where Hiram had provided him with his newest weapon, a "magic" flute. Seeking to use it against Bane, Prankster disguised himself as an old man so he could avoid notice as he made his way to Bane's headquarters, but he spotted a woman being accused by police of writing anti-Bane grafitti. Knowing that she was innocent, as he was the guilty party himself, he sought to save the woman by confessing, but one of the aggressive officers pushed him away, causing his disguise to rip. Spotting the costume under his coat, the police realised he was the Prankster and, threatening to shoot the girl if he tried to escape, they placed a gun at his head, announcing they had orders to shoot him on sight. ("The Vengeane of Wratt") The next episode of the story, which was never published. (Aardvark-Vanaheim in 3-d #1, Normalman story) The Prankster was one of a number of heroes who tries to help Normalman across the road. Comments: Created by Denny O'Neill (under the pseudonym Sergius OShaughnessy) and illustrated by Jim Aparo. 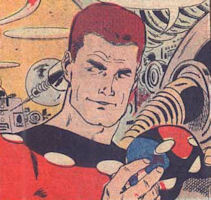 The character was O'Neill's first creation, and only appeared once, in a back-up feature in the final issue of Peter Cannon, Thunderbolt. Some information taken from Comic Book Profiles site, used with permission from and gratitude to Rich Meyer, creator of same.